Background: Monteggia fracture dislocation is proximal ulna fracture with radial head dislocation. We present a rare case of monteggia fracture dislocation Bado type III with ipsilateral distal radius physis injury Salter Harris type II in an eight year old boy. It is to highlight the importance of clinical examination and the need of radiograph one joint above and below the fracture. Case Report: 21 Patients with failed conservative or unstable pott’s spine were treated with single stage debridement and posterior stabilization and fusion with pedicle screw and bone graft. Post-surgery patients were excluded. Back pain and quality of life were evaluated with a Visual Analog Scale (VAS) and the Oswestry Disability index (ODI). At the follow-up radiological studies were performed at 1, 6 and 9 months interval and later yearly interval, to check for fusion. Conclusion: This report highlights the rare combination of Monteggia fracture dislocation with ipsilateral distal radius physis injury and emphasizing the universal rule of examining one joint above and below and including both when taking radiographs for suspected long bone fractures. Keywords: Monteggia fracture; distal radius; distal ulna; physis; missed. Monteggia fracture dislocation is proximal ulna fracture with radial head dislocation. It was first described by Giovanni Batista Monteggia in 1814. It is an uncommon injury in children comprising only 0.4% of all forearm fractures [1, 2]. Bado classified the injury into four types depending upon the direction of radial head dislocation . We present a rare case of monteggia fracture dislocation Bado type III with ipsilateral distal radius physis injury Salter Harris type II in an eight year old boy. The purpose of this case report is to illustrate the importance of clinical examination and the need of radiograph one joint above and below the fracture, as well as the mechanism of injury and treatment modalities of this unique type of fracture. We report an eight year old male child with a history of fall from the roof on outstretched hand while flying kite (a common leisure activity in India during the festive seasons) following which he presented to the emergency department with pain and swelling on the elbow and the forearm with puncture wound over the proximal third of the ulnar side of the forearm of left upper limb. On examination, there was swelling over the elbow and the forearm extending to the wrist with tenderness predominantly over the upper forearm and wrist. The distal pulses were palpable and nerve functions were intact with no signs of compartment syndrome. The wound toilet was done and the limb was splinted. Plain radiograph of the elbow with forearm and wrist were obtained revealing a Bado type 3 Monteggia fracture dislocation with Salter Harris type 2 physeal injury of the distal end of radius with fracture of distal end of the ulna (Fig. 1). The patient was planned for debridement and open reduction for proximal ulna fracture and close reduction for distal radius physis injury. The proximal ulna fracture was fixed with a 6 hole low contact dynamic compression plate (LC-DCP). Following fixation, the radial head got reduced and was stable (Fig. 2). Moving to the distal extent of the injury, an attempt of closed reduction of the distal radius physeal injury was made with an apprehension of failure in view of the skin puckering at the volar aspect of wrist suggesting a soft tissue interposition. As was suspected, the attempt failed and an open reduction of the distal radius was performed by volar approach. Intra operatively, the pronator quadratus was found entrapped in the fracture site. The interposition was removed and the reduction was obtained and stabilized with K- wires (Fig. 2). The distal ulna fracture appeared stable and well aligned excluding the need of fixation. Wound closure was done over the drain and an above elbow plaster slab was applied. Patient was kept on strict limb elevation and intravenous antibiotics started. Wound inspection was done at third post-operative day and was found to be healthy. Sutures were removed at 14th post-operative day. At three weeks, check x ray was obtained showing healing at fracture sites with well-maintained alignment. K wires from the distal end radius were removed at 5th week post operatively and gentle elbow range of motion (ROM) with wrist supination pronation was initiated. The child obtained full movement at elbow, forearm and wrist at 7th week post operatively with no signs of infection (Fig. 3). At 4th month post op, the X ray revealed satisfactory union at fracture site (Fig. 4) encouraging return to normal activities. Type I – Proximal ulna fracture with anterior dislocation of radial head. Type II – Proximal ulna fracture with posterior dislocation of radial head. Type III – Proximal ulna fracture with lateral dislocation of radial head. Type IV- Ulna and radius fracture at same level with anterior dislocation of radial head. Monteggia lesion with epiphyseal fracture of ipsilateral distal radius in children has been rarely reported in the literature (Table 1) [3-10]. There were eight such cases reported in English literature, of which Monteggia Bado type III with distal radius Salter Harris type II were most commonly seen. In majority of cases, proximal ulna fracture was treated with open reduction and distal radius with close manipulation and had full range of motion (ROM). Monteggia fracture dislocations in children are a result of low energy trauma leading to non-comminuted closed fracture, while this type of injury in adults is usually because of high velocity trauma . The exact mechanism of injury causing this type of two level forearm fractures is not clearly understood. However, a fall onto the outstretched hand, dorsi-flexed wrist, and pronated forearm can lead to the fracture of distal radius physis. As the force travels upward towards the elbow, a varus rotational force comes into play along with longitudinal compression that is responsible for the Monteggia fracture dislocation. As in this case, the child fell from the height onto outstretched hand, a particular direction of rotational force came into play, causing this unique type of injury. Monteggia lesion can easily be missed in children due to difficulty in performing proper clinical examination. Missed Monteggia lesions are associated with significant limb deformity and restriction of supination and pronation. Disruption of radio-capitellar line in the X-ray of the elbow joint is a useful radiological sign for diagnosis of a Monteggia lesion . Properly assessing the injury is the key to prevent the disability of the limb. Monteggia fracture dislocation with ipsilateral distal radius physis injury is rare. A good clinical examination and full length forearm radiographs should be taken to avoid missing ipsilateral wrist injuries in cases of elbow injuries. This report highlights an extremely rare injury, a combination of proximal and distal forearm injuries. The awareness of this possible injury combination is important to avoid missing a second lesion, which may be hidden. The lower end of the forearm must be included in the initial radiographic examination. Early recognition and prompt surgical intervention can lead to a good result despite the rarity and seriousness of this injury. One would like to emphasise that the mechanism of injury needs to be taken into consideration at all times. With an obviously angulated distal third injury, the features of a dislocated radial head tend to be masked and very easily missed, unless the possibility is considered. The universal principle of examining one joint above and below and including both when taking radiographs for suspected long bone fractures must not be forgotten. 1. N. Peter, S. Myint. Type I Monteggia lesion and associated fracture of the distal radius and ulna metaphysis in a child. Can J Emerg Med. 2007; 9: 383–386.1. N. Peter, S. Myint. Type I Monteggia lesion and associated fracture of the distal radius and ulna metaphysis in a child. Can J Emerg Med. 2007; 9: 383–386. 2. E.M. Evans. Pronation injuries of the forearm with special reference to the anterior Monteggia fracture. J Bone Jt Surg Br. 1949; 31: 578–588. 3. J.L. Bado. The Monteggia lesion. Clin Orthop Relat Res.1967; 50: 71–86. 4. Song KS, Bae KC. Type III Monteggia Equivalent Fracture with Ipsilateral Distal Radial Epiphyseal and Ulnar Metaphyseal Fracture in a Child: Case Report. J Korean Orthop Assoc. 2004; 39(5): 563-565. 5. Sood A, Khan O, Bagga T. Simultaneous monteggia type I fracture equivalent with ipsilateral fracture of the distal radius and ulna in a child: a case report. Journal of Medical Case Reports. 2008; 2: 190. 6. Nataraj A. R. and Sreenivas T. Type III Monteggia fracture with ipsilateral epiphyseal injury of the distal radius. European Journal of Orthopaedic Surgery & Traumatology. 2011; 21(3): 185–187. 7. Williams HL, Madhusudhan TR, Sinha A. Type III monteggia injury with ipsilateral type II Salter Harris injury of the distal radius and ulna in a child: a case report. BMC Research Notes. 2014; 7: 156. 8. 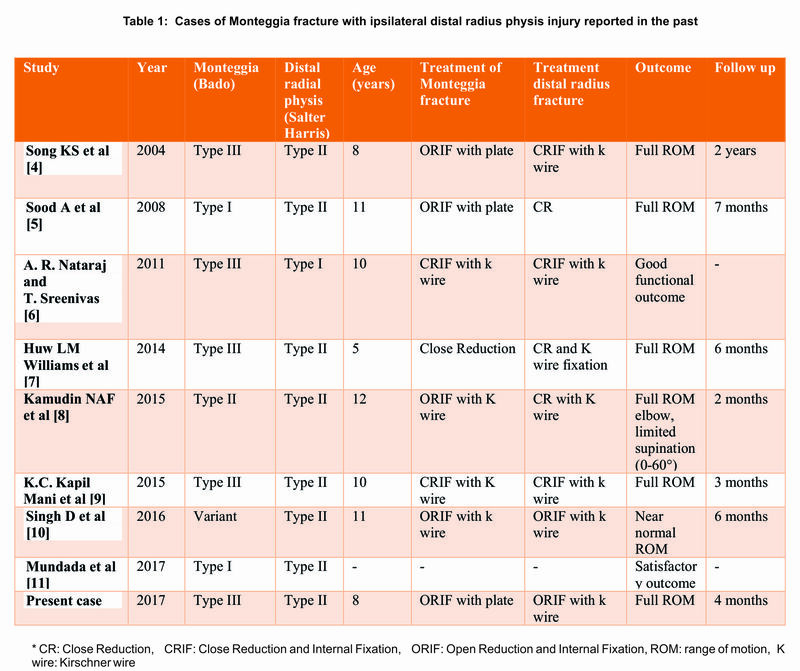 Kamudin NAF, M Firdouse, Han CS, M Yusof A. Variants of Monteggia Type Injury: Case Reports. Malaysian Orthopaedic Journal 2015; 9(1). 9. Kapil Mani KC, Sigdel A, Rayamajhi AJ. A rare combination injury of type III Monteggia fracture dislocation and ipsilateral epiphyseal fracture of distal radius in children. Is there a probability of missing the Monteggia component? Chin J Traumatol. 2015; 18(1): 51-3. 10. Singh D, Awasthi B, Padha V, Thakur S. A Very Rare Presentation of Type 1 Monteggia Equivalent Fracture with Ipsilateral Fracture of Distal Forearm-approach with Outcome: Case Report. J Orthop Case Rep. 2016; 6(4): 57-61. 11. Mundada G, Khan SM, Singhania SK, Gupta V, Singh PK, Khan S. Type-I monteggia with ipsilateral fracture of distal radius epiphyseal injury: A rare case report. Ann Afr Med. 2017; 16(1): 30-32. 12. M. Letts, R. Locht, J. Wiens Monteggia fracture dislocation in children. J Bone J Surg Br. 1985; 67: 724–727. 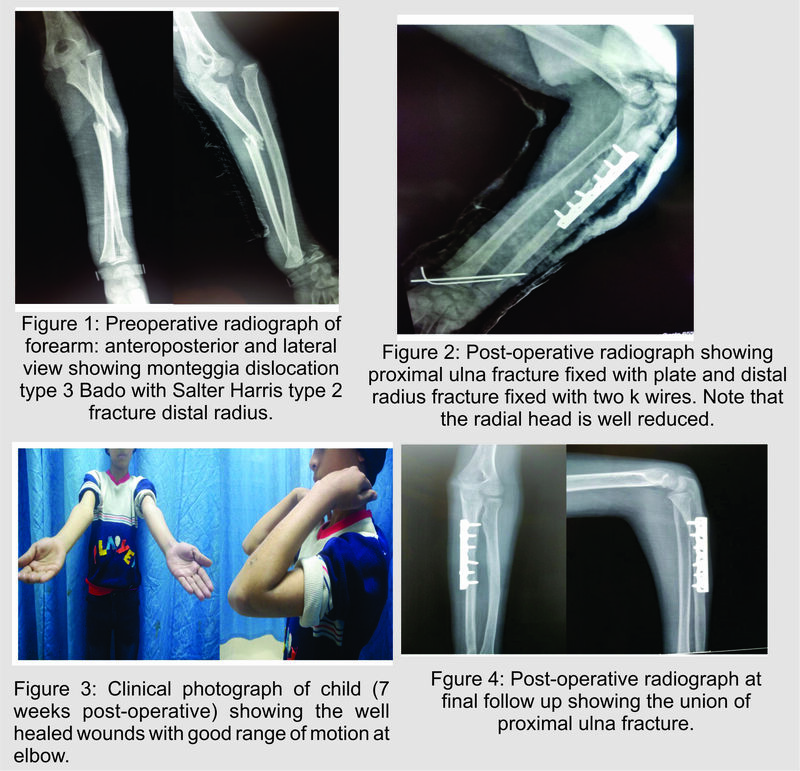 How to Cite this article: Karkhur Y, Tiwari A, Bhatnagar N. Monteggia fracture dislocation with ipsilateral distal radius – ulna fracture in a child: A case report. Journal of Trauma and Orthopaedic Surgery. April – June 2017;12(2):23-26. Monteggia fracture; distal radius; distal ulna; physis; missed.